“You gotta break all the records set.” (Rod Stewart). 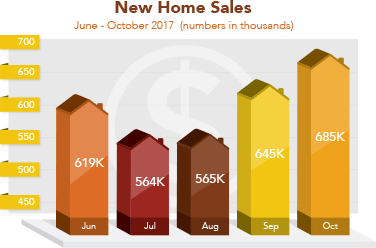 New home sales increased across the country in October, breaking through to their best level in a decade. The Commerce Department reported that sales of new homes in October rose to their highest level in 10 years, rising 6.2 percent from September to an annual rate of 685,000 units, above the 629,000 expected. September was revised lower to 645,000 units from 667,000. Year-over-year, new home sales rose 18.7 percent. Currently, there is a 4.9-month supply of new homes for sale on the market. A six-month supply is seen as a healthy balance between supply and demand. Home prices continued to rise in September, buoyed by low mortgage rates, an improving economy and a strong labor market. The September S&P/Case-Shiller 20-City Home Price Index rose 6.2 percent year-over-year, above the 5.8 percent registered in August. It was the biggest increase in more than three years. Strong economic growth continues, as seen in the second reading on third-quarter Gross Domestic Product (GDP). Third-quarter GDP rose 3.3 percent, up from 3 percent in the first reading. This was the best number since the third quarter of 2014, despite consumer spending falling to 2.3 percent in the third quarter of this year. In 2017, GDP registered 1.2 percent in the first quarter and 3.1 percent in the second quarter. GDP is the monetary value of all finished goods and services produced within a country’s borders in a specific time period. It is considered the broadest measure of economic activity. Meanwhile, inflation remained tame in October. The Fed’s favorite inflation gauge, Core Personal Consumption Expenditures (PCE), was up 0.2 percent from September. Year-over-year, Core PCE was 1.4, up from 1.3 percent the month prior, remaining well below the Fed’s 2 percent target range. At this time, home loan rates remain in attractive territory. The Fed will be watching for the latest employment figures as the November Jobs Report is delivered on Friday. The ISM Services Index will be released on Tuesday. The ADP National Employment Report is due to be delivered on Wednesday, along with Productivity. On Thursday, weekly Initial Jobless Claims will be released. The week wraps up with more employment data from Friday’s release of the November Jobs Report, which includes Non-Farm Payrolls, the Unemployment Rate and Average Hourly Earnings. The Consumer Sentiment Index will also be released on Friday.